Experience the many moods of Uluru at sunset with an uninterrupted view. Admire the immensity of Uluru as you immerse yourself in the environmental changes of this world-renowned icon at sunset. Your friendly, professional guide will collect you from the entrance to your accommodation at Ayers Rock Resort. 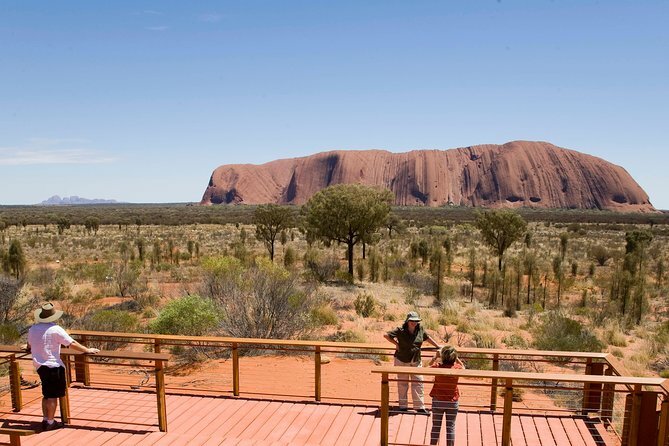 Travel by comfortable, air-conditioned vehicle to Uluru-Kata Tjuta National Park. From the entrance it is only a matter of minutes before the vista of Uluru rises from the sand dunes to demonstrate its enormity and presence in this country. As you drive around the base, your guide will take you along the Mala Walk to the impressive Kantju Gorge. Learn about the Mala People and the importance of ceremonies. Further around the base of Uluru visit Mutitjulu Waterhole, a semi-permanent watercourse nestled in the contours of Uluru. Here you will learn of the Creation stories of Liru (poisonous snake) and Kuniya (woma python). You will see rock art of the ancients and learn how Uluru was, and still is, a significant location for teaching young Aboriginal people. You will then travel to Talinguru Nyakunytjaku dune viewing area where you will observe the sun set over Uluru from a different perspective and away from the crowds. Relish in the tranquility and appreciate the expanse of this beautiful desert region as night falls. Enjoy a glass of sparkling wine and light refreshments before returning to your hotel at Ayers Rock Resort.